You are here: Home / Health / Yes, Why Black Women Lose Their Hair. Yes, Why Black Women Lose Their Hair. 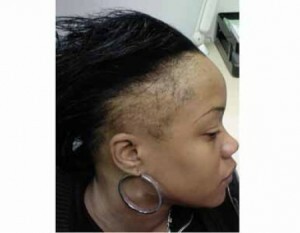 (ThyBlackMan.com) What are the most common causes of hair loss for black women? The average scalp has 100,000 hairs. Each follicle produces a single hair that grows at a rate of half an inch per month. After growing for two to six years, hair rests awhile before falling out. It’s soon replaced with a new hair, and the cycle begins again. At any given time, 85% of hair is growing, and the remainder is resting. So what are some common reasons for hair loss in women? Alopecia areata causes hair to fall out in startling patches. The culprit is the body’s own immune system, which mistakenly attacks healthy hair follicles. In most cases, the damage is not permanent. The missing patches usually grow back in six months to a year. In rare cases, people may lose all of the hair on their scalp and body. Some women may notice their hair seems fuller during pregnancy. That’s thanks to high levels of hormones that keep resting hairs from falling out as they normally would. But it doesn’t last forever. After childbirth, when hormone levels return to normal, those strands fall out quickly. This can mean a surprising amount of hair loss at one time. It may take up to two years for hair to return to normal. A little known side effect of birth control pills is the potential for hair loss. The hormones that suppress ovulation can cause hair to thin in some women, particularly those with a family history of hair loss. Sometimes hair loss begins when you stop taking the pill. Other drugs linked to hair loss include blood thinners and medicines that treat high blood pressure, heart disease, arthritis, and depression. It’s no myth: Wearing cornrows or tight ponytails can irritate the scalp and cause hair to fall out. The same is true of using tight rollers. Let your hair down, and it should grow back normally. Be aware that long-term use of these styles can cause scarring of the scalp and permanent hair loss. Another reason why a great number of black women lose their hair is because of laziness. Maintance is a key factor in obtaining/keeping healthy hair. There are entirely too many hair products for black women that’ll encourage hair growth. While the article states common (medical) causes, not all black women suffer from these problems. And the ones who do would rather cover up the problem with wigs, weaves, and such. If black women would take 1-2 hours a day to care for their hair, they would have lots of it. I do know they wouldn’t be making the Chinese and Koreans rich by buying wigs and packaged hair. There’s so much info online about how to take care of your own hair from the scalp out. A great remedy for hair loss is organic coconut oil;apply it three times a day to the affected area.IT’s a natual cell rejuvenator also you can cook with it you can use it like butter or a spread. DO some reading on the subject.